When Hi-Tech Expressions — the equivalent of “Mr. 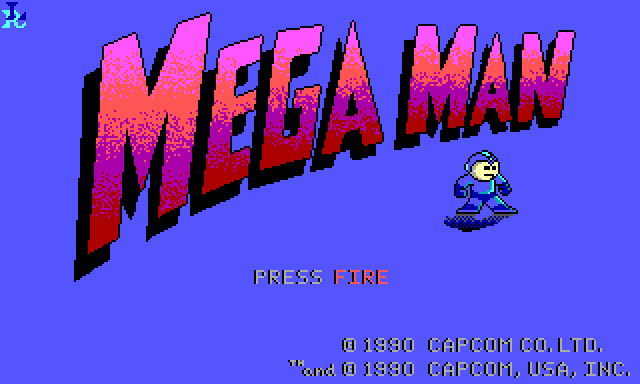 and Mrs. Johnson from down the street” — got a license from Capcom to make their own Mega Man game on Windows back in 1990, the project was all assigned to one guy. That means the same person who did the programming also did the artwork, planned the story, and designed the enemies, traps, and general difficulty level. As any of you indie game developers who’ve tried to go it alone know, combining a programmer with any one of those jobs is a recipe for disaster. But all of them put together? That’s worth an article. As a result of assigning a sensible, practical, logical programmer to the role of art director, Mega Man for MS-DOS is probably the most unique take on the Mega Man series I’ve ever seen. It’s kind of like a reboot replacing Capcom’s fantasy futurism with a gritty, low-budget, real-world atmosphere. The enemies aren’t humanity serving androids gone bad, but a bunch of mechanical bees, mice, and frogs programmed for murder. The locations aren’t mechanical forests and sky fortresses, but a warehouse, electric power plant, and water treatment facility. The gameplay resembles Commander Keen in typical run-jump-shoot maze navigation, and the music resembles it in being nonexistent (another practical real world detail). This isn’t the Rockman of the year 20XX, this is Mega Man battling through 1990’s inner city Chicago. The levels have a certain logical flow to them that I don’t remember seeing in the Mega Man series (and to illustrate, I’m linking to the magnificent VGMaps.com). For example, fighting Wood Man in Mega Man 2, you’re in a mechanical forest with repeating background elements from start to finish. 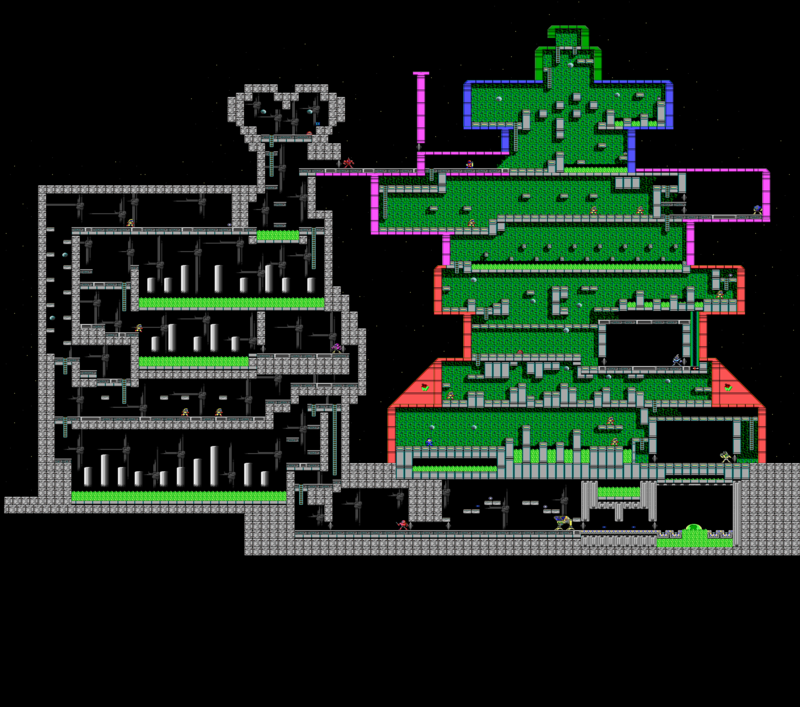 But here, when fighting DynaMan, you start out in a warehouse setting and proceed to work your way deeper and deeper down, through a conveyor system, then down to its molten production system, then down through the foundation’s bedrock to the secret layer of the robot master that the warehouse is a front for. These level layouts are clearly suggesting a story, which I do admire. The silence is an interesting effect. It makes me imagine a game where the beginning of a level has music playing like normal and then gets quieter, more distant and claustrophobic the deeper you go and closer you get to the boss, to add tension. Games should have more fun with their soundtracks like that. How about a level where all the traps are synchronized to the music’s beats? The intro screen to the final level was particularly charming. This was it. You’ve clawed your way through the three robot masters and now have access to the mastermind behind it all. You will now at last encounter the mysterious Dr. Wiley face to face by infiltrating… the back door of his house at the corner of Hopkins Street. Yeah I know that’s not what it’s supposed to be, but it’s what I need it to be because by now I’m completely taken by this almost meta B-movie campy aesthetic. It’s like the game is *about* a low-budget Mega Man remake, like they licensed a fanmade movie instead of the NES game. Look at the grass. This isn’t a Wily fortress, this is the fence to Gru’s back yard, three blocks up from the neighborhood middle school. This game may not be good, but I think I love it. I want that skull to be canonically made of hollow plastic. 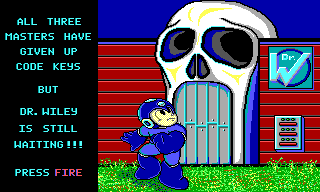 Storywise, it’s as if the game is a prequel to the actual Mega Man series. Behold, the early days back when government funding for humanity-serving robots was tight and the industry was still a startup, but the life-and-death battles between the forces of good and evil were already starting to break out. I should probably stop going off on these tangents, but while the game gives you no story and few details, the details it does give are so tantalizingly specific (The silhouette in the guard tower, radioactive waste in the water treatment plant, etc.) that now I can’t stop thinking about it. It’s like giving a kid a piece of blank paper but with some small buildings meticulously drawn in the corner. That kid *has* to complete what’s left undone by drawing Godzilla or else he’ll go insane. Beat the game and you get an ending only a programmer could love. No doubt a letdown for the kids who wanted a flashy reward for their efforts, but as was commonly a hot debate back in GamePro Magazine days, shouldn’t beating the game be its own biggest reward? In this case the way I sympathetically see it, it’s better to have a programmer give you a brief congratulations than to ask him to write an exciting story for kids on top of everything else he’s not supposed to be doing. It’s a short disposable game, but back in 1990 it was good enough for a sequel. And for their second game, Mega Man 3 — titled to match the number the NES was on at the time — the game credits saw a change. Credits for sequel. Still the smallest credit screen you’ll ever see. As impressive as it is that they doubled their staff for the sequel, it does look suspiciously like the last guy just called his brother and asked if he could draw. Despite that sounding like a jab, the end result was actually quite an improvement. 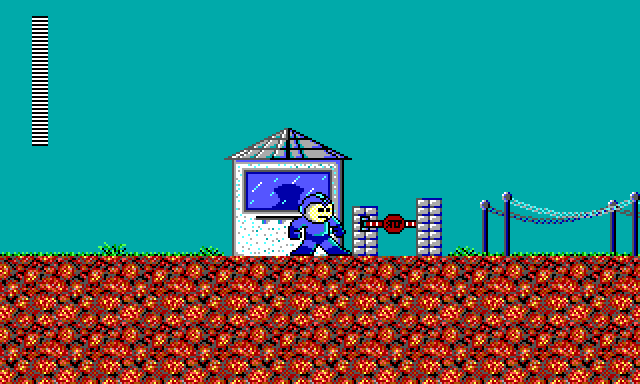 In Mega Man 3, the stages now become full maze-like worlds with multiple paths. Although you don’t get the full effect playing through them screen by screen, VGMaps shows what’s going on. Wave Man: that’s an actual, complete barge you’re fighting through, docked at a shipping port, requiring you to discover the enemy’s hidden underwater stronghold. Torch Man: you’re fighting life and death battles in the dark sewers underneath a quiet neighborhood. Shark Man (Shark Man! ): you fight through a reef complete with a sunken ship. All of the bosses I might add have done away with the traditional boss gates and are now sealed behind pressure vault doors. A very authentic (“logical”) touch. Twice the bosses and twice the size of each level? That’s a sequel that delivers. Ah, now they’re getting it. Dr. Wiley at last gets a Wiley castle that we’re used to seeing, and I like it because you actually fight through a cross-section of it. That kind of thing is pretty cool. When you finally reach him, he’s stationed inside a moat of anti-megaman insta-death acid, hurling what appears to be radioactive nuclear rods at you. Now that’s mad scientist level crazy. In the end, just about everything in this game can be explained by there being only one name in the credits. Yes, it’s easy to make fun of the DeviantArt quality graphics but that’s what you get when you make programmers draw — especially under deadline. Yes, it’s frustratingly difficult, but when you have someone designing the levels who routinely solves challenging problems for a living, he’s not going to gyp you by making it easy. No, there’s no music. Would you prefer that or horrible music? I leave you with this thought. It’s been over 25 years since Mega Man for MS-DOS was made, but you still see this game all the time on Steam: whenever a programmer says ‘I’ll just do the art myself,’ or an artist says ‘wow, this app can make the whole game for me just by drag-and-drop,’ or anyone who doesn’t have a doctorate in computer science says ‘3D doesn’t look that hard’, somewhere the ghosts of Mr. and Mrs. Johnson from down the street rise from their graves and spawn another evil guard dog. Chicago can’t afford that, and neither can you. Don’t go it alone. Not my proudest completion back in the day. Thanks for the detailed dish of nostalgia! The pixel-work makes me think of the B-film that is the “so-bad-it’s-good” concept.